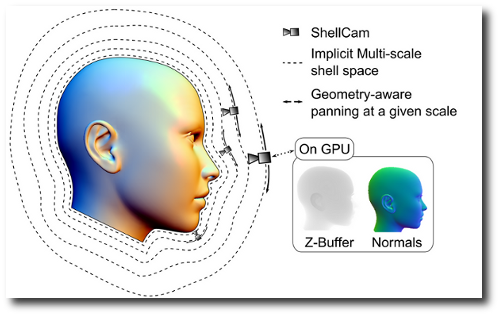 We introduce ShellCam, a geometry-aware virtual camera control model which defines a smooth motion subspace enabling Pan-and-Zoom navigation on arbitrary 3D objects. The basic idea is to define a scale-dependent offset shell around the visible geometry which provides, at any point, a meaningful tangent direction for panning and helps computing the camera-object distance to rule accurately a logarithmic zoom motion. We define the underlying motion space as a visualization hull and evaluate it on-the-fly using a moving least-squares approach. As a result, ShellCam provides smooth object-aware 3D motions, combining rotations and translations, based on a simple 2D user input such as typically produced by mouse motions. We also provide an efficient GPU implementation which makes use of the standard rasterization pipeline to compute this 3D motion efficiently. Our approach is robust to inconsistent geometry such as point clouds or polygon soups, works on shapes with complex topology, does not require any pre-computation and can be used on dynamic data. ShellCam offers a convenient control for 3D inspection tasks and a transparent swap with other control models for more general 3D navigation. Last, our model is straightforward to integrate in any 3D application.